Wishing everyone a very Happy Thanksgiving! This is a special day to spend with our family and friends, and to reflect on the many joys that each of us have in our lives. I wish you all the very best! 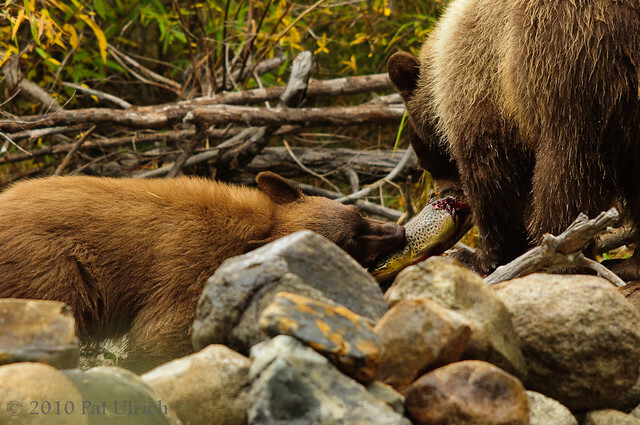 A female black bear with a freshly caught male Kokanee salmon in Taylor Creek near Lake Tahoe. 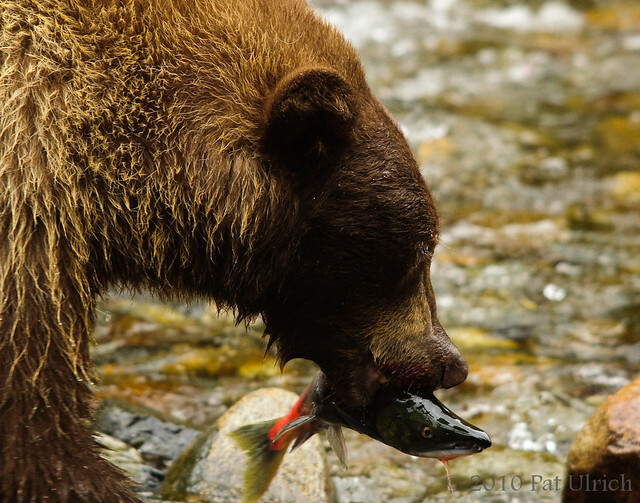 While this shot is an ok profile of the bear, I really loved how the salmon turned out. You can see what a beautiful fish they are when in the breeding form. And a huge congrats to the Giants for their game 1 victory last night over Cliff Lee and the Rangers. I thought they would pull out a win against him, but not quite in that high-scoring fashion! Go Giants! 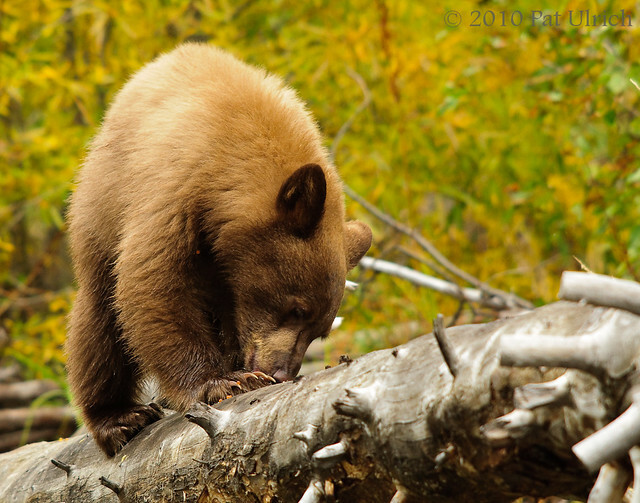 A black bear cub finishing up the last scraps of a Kokanee salmon on a log alongside of Taylor Creek. 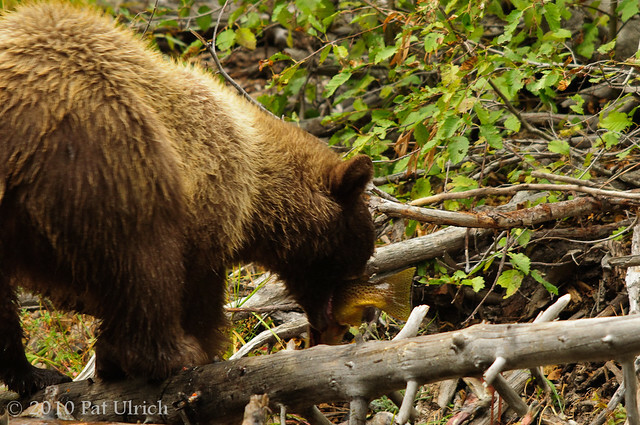 This was one of the few frames where I was able to get some of the autumn color behind the bears as well. 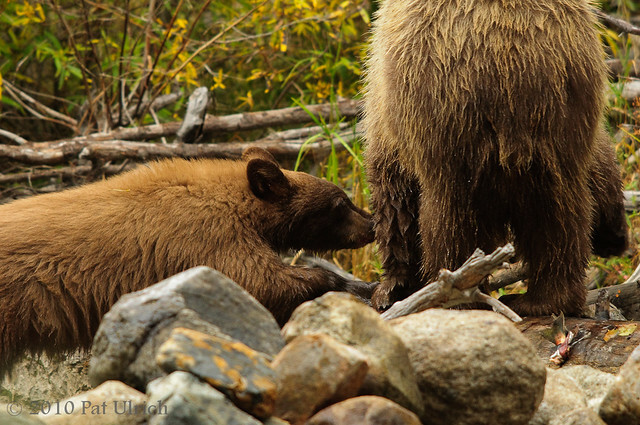 This cute little black bear cub belongs to the mother bear from my previous posts. It was really fun to watch him bound around the creek side, and he even caught a few salmon for himself. 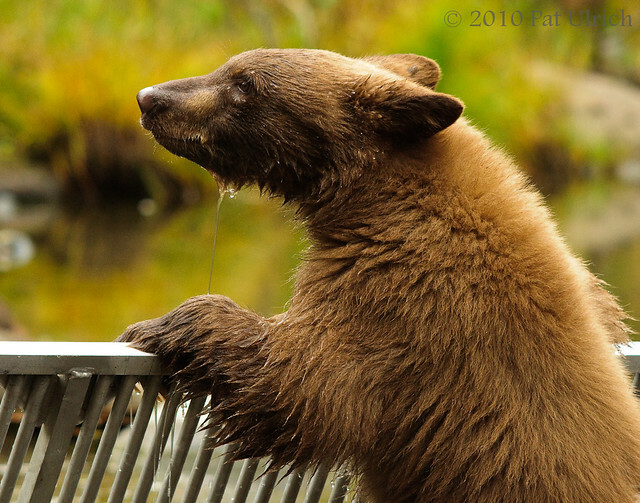 In this shot he's taking a quick break from chasing the fish to see what was happening upstream of the salmon fence. 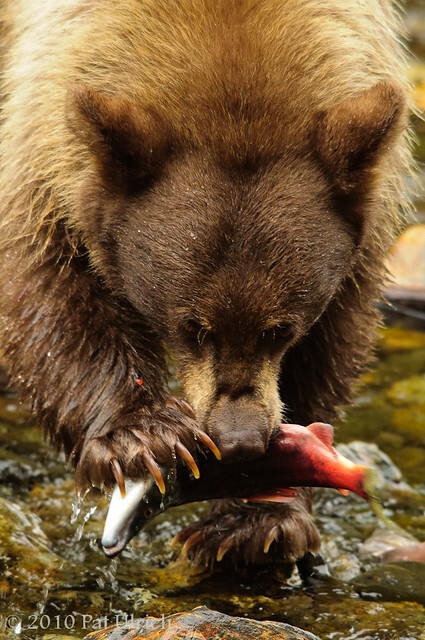 A black bear finishing up a freshly caught Kokanee salmon. Early on in the encounter, she must have been fairly hungry since she ate just about every part of the fish but the tail. 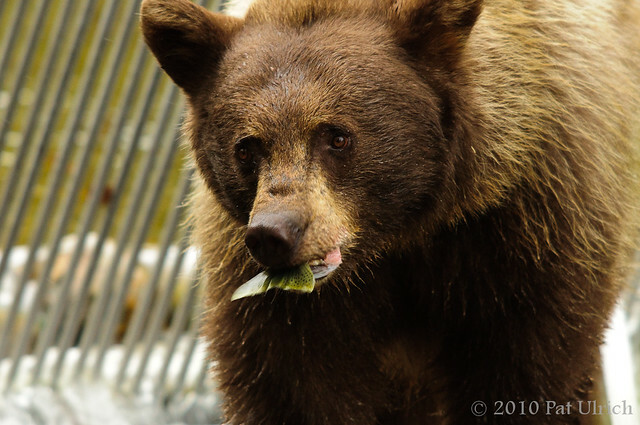 But by the end of her visit to the creek, she was being much more selective about the parts of the fish she wanted to consume. You might have noticed the metal fence behind her, which crossed the length of the stream. This was put in place by the Department of Fish & Game to keep most of the salmon in the lower part of the stream in order to facilitate the collection of eggs for hatchery use. 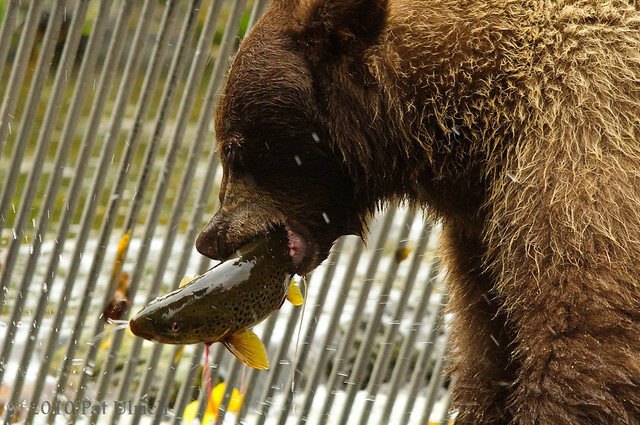 This created quite a concentration of salmon right at the gate, and the local bears definitely figured that out! Here's a "making of" shot for this image sequence, courtesy of my wife. 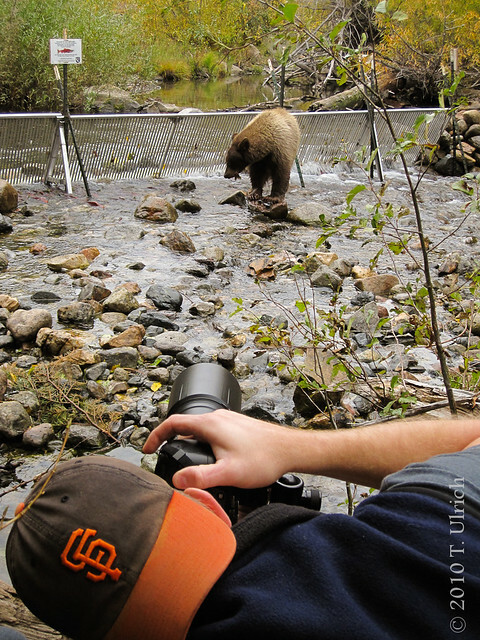 We were up on a stream bank (along with many other people watching the bear) and were remarkably close. 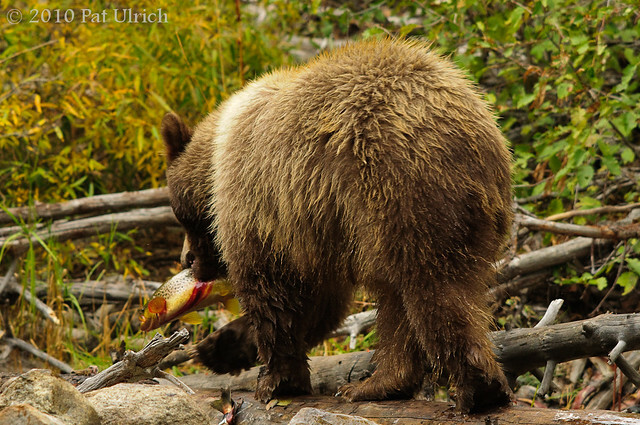 In any other situation it would have felt too close, however, it was clear from the relaxed behavior of this bear that she was only interested in the fish, and she barely paid attention to the throngs of people watching along the shore. And since this shot clearly shows my baseball allegiance, I'll sneak in a "Let's Go Giants!!" -- we're up 2-1 in the NLCS!